MARKET AWAITS ‘BIG B’ ON MONDAY - 03/07/2009. The market has clearly given a positive move by going up and closing above critical resistances, due to strong buying witnessed in the last one hour of Friday’s trade. If the budget meets the expectations and manages a positive surprise, then the Sensex will have a target of 16342-17188 and Nifty will have a target of 4926-5243. If the budget is on expected lines or just falls short on expectations then the market is likely to move down and fill the gap between Sensex 13479-12256. FINALLY THE ‘BIG B’ ON MONDAY. In what can be called as one of the most awaited budget in recent history, the market awaits this event with baited breath. The expectations this time from the FM are shooting through the roof as the Corporates, the Industry and the common man expect anything and everything from this budget. The overwhelming expectations are a result of the extraordinary one sided triumph of the UPA government in the recent elections. The thumping victory gives a clear road for the FM to go ahead and kick-start the reformation process and put the economy on track to achieving over 9% GDP growth. The expectations are so high that even if this budget turns out to be a blockbuster one, majority of its ingredients must have already been factored in by the market, thus leaving little or no room for surprises. Even a small slip or a delay in execution of reform process will be taken negatively by the market. Thus it will be quite a difficult task for the FM to fulfill. Let us see how he delivers one of the most awaited economic act on Monday, till then keep your fingers crossed. The Railway Minister Mamata Banerjee presented the Railway budget which was more popular in nature than economic. There was no change in passenger fares and freight rates. Even the Tatkal fares were reduced. The Railways will introduce 50 mobile rail ticket vans and railway ticketing will be possible even from post offices. The students discount has also been increased. Lower fares have been given for low income group under the name of ‘Izzat’ scheme. These measures are seen as popular ones to appease the masses. It was not that there was no reform oriented part, the focus was on the overall development of the Railways. Twelve nonstop point to point train services between select cities were announced along with development of 50 world class stations. Mamata Banerjee also proposed to use the idle land bank of the railways to good productive industrial usage. Over the years, I have observed the Rail Minister has always been a colourful character. If Lalu was the previous Rail Minister, now it is Mamata. Surprisingly Lalu transformed Railway into one of the strongest profit making PSUs, now it is in the hands of Mamata. Let us see whether Mamata can take the Railway forward, making it modern and more profitable. Sensex opened the week at 14815, made a high of 14955, made a low of 14355, and closed at 14913, thus registering a weekly gain of 149 points. Sensex has once again made a Hammer for second consecutive week. The Hammer was a result of strong buying which was visible between 14355-14526. Sensex went down during the week but made a higher bottom at 14355 as compared to the previous week’s low of 14016. The Sensex seems to be taking good support at 100 Week M.A. which falls at 14248. The price ROC has given a Buy signal, while MACD is trying to bend and move upwards, but is yet to give a buy signal. The RSI too is trying to move up. 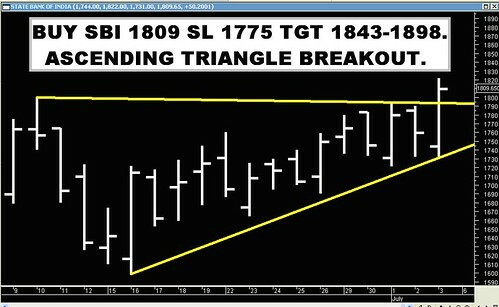 Sensex has made a Bullish formation and immediate target for that falls at 15320-15555. 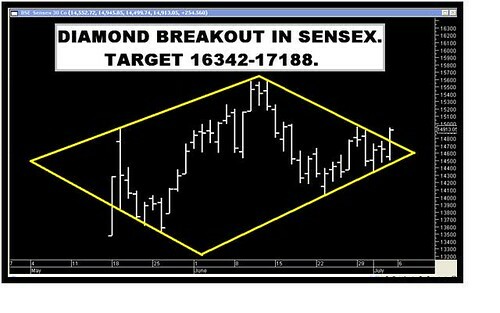 The Sensex has made a Bullish continuing pattern known as Diamond formation, which can be seen below and the target for that is 16342-17188. The Trendline support for Sensex is at 14548-14244. For the week ahead the Resistance is at 15257-15600-15991-16342. Support is at 14256-14355-14016-13611. 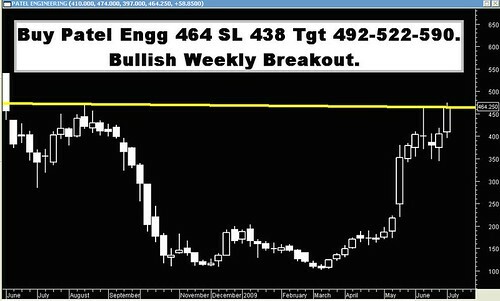 Nifty opened the week at 4375, made a high of 4439, low of 4249, and closed at 4424. Thus the weekly gain was 49 points. 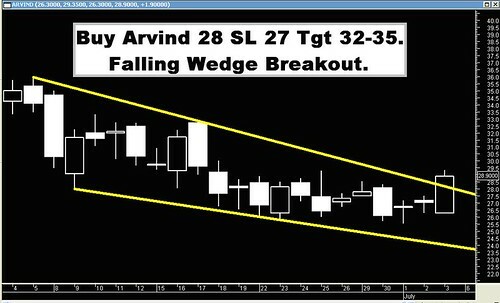 Nifty has once again made a Hammer for second consecutive week. The Hammer was a result of strong buying which was visible between 4250-4320. Nifty went down during the week but made a higher bottom at 4249 as compared to the previous week’s low of 4143. The Nifty seems to be taking good support at 100 Week M.A. 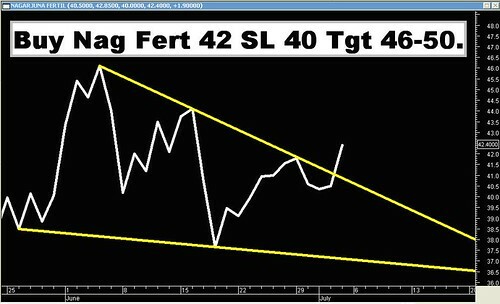 which falls at 4270. The price ROC has given a Buy signal, while MACD is trying to bend and move upwards, but is yet to give a buy signal. The RSI too is trying to move up. 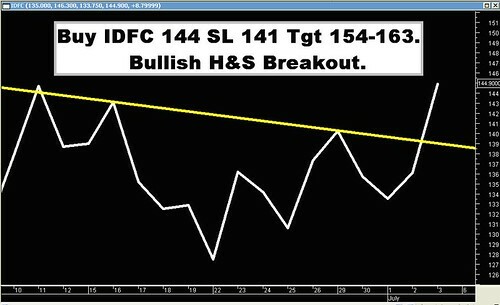 Nifty has made a Bullish formation and immediate target for that falls at 4561-4629. 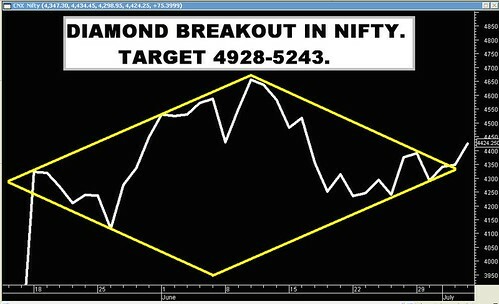 The Nifty has made a Bullish continuing pattern known as Diamond formation, which can be seen below and the target for that is 5928-5243. The Trendline support is at 4301-4167. Nifty is seeing lot of Strangles at the strikes of 4200 and 4700. 4400 is also seeing lot of Straddles being bought. For the week ahead, the Resistance is at 4509-4629-4693-4802. Support is at 4365-4249-4155-4092. Despite the extreme volatility prevailing in last week our stocks did wonderful as all reached their targets except Financial Tech. Cost of constructing the Spread is Rs. 2.5 (Rs. 13,125) which can be the max loss and the max profit will be Rs.5 (Rs.26,250).